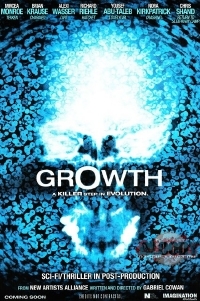 Since reporting on Gabriel Cowan's gooey, Slither inspired, new horror film Growth, we've been watching the film's official website, eagerly awaiting some footage. Well lo and behold, today we've got it in the form of an extended AFM sales reel. Jamie Akerman fled the outbreak, which took her mothers life, twenty years ago. She now returns with her boyfriend and step brother, to sell the family property. There, they uncover the key to Jamie's disturbing past, and have to fight a new strain of parasite that has emerged, to threaten the island once again. Watch the trailer here and check out some gooey stills after the break. I can't wait for this flick!!!! Parasites and hot chicks AWESOME!!! This looks sick. The fx - whatever - but the rest looks killer. Can't wait!!! Hey, there's new stuff on their site!